Hello again, everyone out there in the MLBlogosphere. I’m guessing that anyone who’s ever read my blog has noticed I tend to go AWOL for long periods of time, and then return with a post from the bottom of my heart about how things have been busy in my life (aren’t they always? ), and how I’ll never leave again. Last time I did this, I had something like 2 posts before I was out the door again. I’ve now done this kind of thing two or three times, and now I’m not going to apologize and promise it won’t happen again. We all have busy lives, with tons of things going on, and there’s really no use complaining about them or using them as excuses for laziness. I’ve noticed that the most successful bloggers on MLBlogs are those who update their blogs every few days; those that are consistent. I have been hardly that, and I may continue to be hardly that. I don’t know. But I’m now well into summer break, and I have a good amount of free time, so I know that I will try to blog as frequently and consistently as possible. So I guess I managed to add a promise for blogging faithfulness after all! But enough with the apologies and promises. Fenway Bleacher Creature is officially back in business! I have missed almost an entire half of the season to write about on MLBlogs, and it would take a very long time to do a complete review post about the Red Sox and baseball this year. It has been a busy and eventful year in the MLB, and nonetheless so for my beloved Boston franchise. 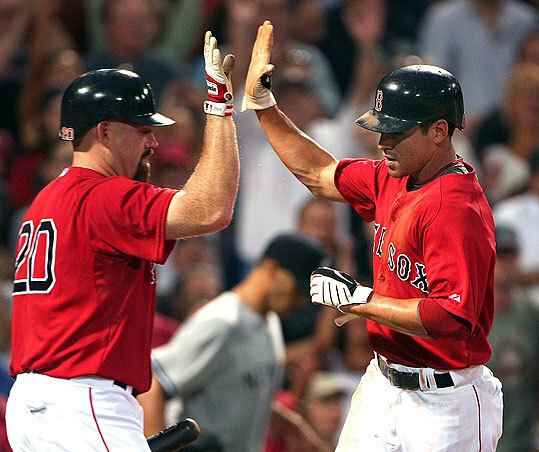 As an attempt to review this season (so far) as best I can, I give you my 5 First Half Red Sox thoughts for the 2010 season. I hope you enjoy these, and if you have trouble staying focused on something for a long time (like me), you can just read the bold thoughts rather than my opinions and elaborations on them. Either way, I appreciate it. #1 – For some reason, the Red Sox are always a bandwagon team. Somehow, the Boston Red Sox seem to always be a bandwagon waiting to happen. In ’04 there were “the Idiots,” a time that, while sometimes annoying, was pretty hard to hate most of the time. We struggled in the early summer months, fighting the Yankees for first place in the AL East and struggling past injuries and slumps. When we reached the playoffs we defeated the Angels without much trouble, then rolled into NYC for what promised to be a series for the ages. And, oh what a series it was. But any baseball fan knows the story of that series. I’m not one to gloat or brag, so I won’t dwell on that great victory for Boston and try to get my shots in at the Yanks and their fans. However, our remarkable comeback in that series sparked a Red Sox bandwagon. Friends in California and Florida told me that they were rooting for the Sox against the Cardinals and that a lot of their friends were as well. While this was nothing like those times when the whole nation rallies around a team, but it was the start of my experience with Red Sox bandwagons and bandwagon fans. Now, in 2010, as the Red Sox, after an absolutely dismal first month or so, have finally climbed back into contention, sitting as of now a game and a half behind New York in the AL East, have turned into a bandwagon as well. Tons of people I know are suddenly claiming that they supported the Sox all along, and that they were there through the worst of it, always knowing that things would get better. I hate to break it to everyone, but… you weren’t. I like to think that I’m a pretty big Sox fan, and there were many times I gave up on my team this year. Everyone gave up on them. However, now that things are all better in Red Sox Nation, these bandwagon fans are popping up everywhere, each one’s claim of undying Red Sox belief and loyalty more ridiculous than the last. And while I am slightly irritated by the most outrageous bandwagon fans, I guess it’s true that because so many of us Sox fans gave up on our team early this season, we’re all technically bandwagon fans. And I’m not gonna deny that. I also can’t deny that the Sox are somehow a bandwagon team every other year, so that long rant about our struggles and our bandwagon fans is all part of my first Red Sox thought, something that I have always found interesting and one that sums up the biggest struggle of our first half of 2010. #2 – We know how to get injured like no one else. I’ll keep this one short and sweet (well, not so sweet). Red Sox players have been dropping like flies, from Varitek all the way to Clay Buccholz, the most recent Sox player to hit the DL. We currently have 4 regular starters injured, as well as a ******** 7 other players on the DL. No other team is even that close to us in terms of injuries. We still can’t compare ourselves to the ’09 Mets, but this is getting pretty bad. And while this is nothing to be proud of, it actually makes me feel kind of good. See, while most every other team has 3-6 players injured, we have 11 PLAYERS ON THE DL! And yet, we are in a battle for first place in the AL East, lead the AL Wild Card race, and by most people’s standards, are one of the top 5 teams in baseball. Our ability to keep winning despite these misfortunes is admirable and gives me hope as to what we’ll be able to accomplish when healthy. But really, let’s stop getting injured (please)! #3 – In my opinion, Dustin Pedroia’s “laser show” is the best baseball quote of the year so far. Unfortunately, he’s currently injured, but this season has just reinforced my love of Dustin Pedroia. He performs in games, entertains off the field, and overall seems like a pretty good guy. This is all why I was so entertained by this quote from him earlier in the season, in response to a question about David Ortiz’s early season struggles. I gotta say, I freaking love this guy. One of my favorite moments of our year so far for sure, and a fun moment that really shows for me why I love the Red Sox. #4 – Big Papi has got to be the best 2nd month player in baseball. In the past few years, David Ortiz has consistently had a lot of trouble in the first month of the season (which the question Pedroia was answering above is based on). However, in the past 2 years especially, he has managed to turn his game around so dramatically in the second month, that it has to get your attention. Now, I’m not a huge stats guy, but I’ve got to put some out here just to show you how crazy a turnaround Papi made this year and last in the second month of the season. That is absolutely ridiculous! However, in June he bounced back to a .238 average and slightly lower stats for those other categories. So, he’s basically a second month superstar, and after that an average ballplayer. And in 2009, the same thing happened towards the end of May and into June. You can check out the stats here if you like. I can’t really think of anyone else who is that good in May as opposed to April, except for maybe CC Sabathia in past years. If you know of anyone, I’d be interested in seeing who, so post a comment about it. But for now, move aside Mr. October, we’ve got a Mr. May. #5 – The 6 Red Sox All-Stars are probably my favorite 6 Sox players, and they really deserve this recognition. I am very happy for Clay Buccholz, Victor Martinez, Dustin Pedroia, Jon Lester, Big Papi, and first year Red Sox player Adrian Beltre. These guys are fantastic, as well as Kevin Youkilis, who is on the Final Vote ballot. He also deserves an All-Star spot, and I encourage everyone to vote for him at mlb.com, I know I will. Tomorrow, I’ll probably write about the All-Star teams, as this is a very popular topic right now. There is both outrage and joy about these teams, so it is a very interesting thing to write about. 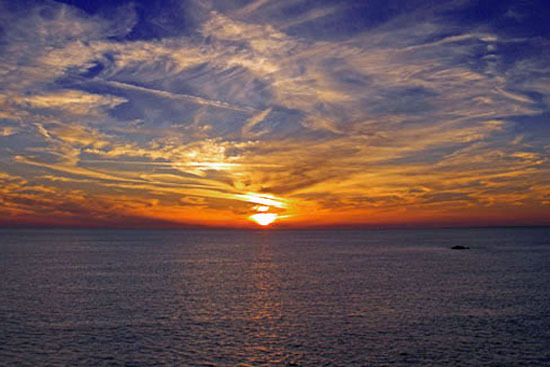 In the meantime, thanks for reading, and I’ll see you tomorrow! If I were to ever find myself in a position of teaching baseball offense to someone, I think I would use last night’s Yankees-Red Sox game as a model for my class. Baseball is a game where scoring is pretty unpredictable. It’s very hard to know when there’s going to be a shutout, or when, like last night, a team is going to score 20 runs. Offense can sometimes be misinterpreted due to this. Just because a team loses 2-1, it doesn’t mean that their offense wasn’t working. They clearly weren’t at their best, but who’s saying they didn’t leave the bases loaded in every inning? They failed to produce, but I think that loading the bases still counts for some sort of offense. Because games like that (stranding the bases loaded so much) are rare, I would probably choose a clear offensive game for any example in my “class”. Last night, was an unbelieveably clear, offensive game. 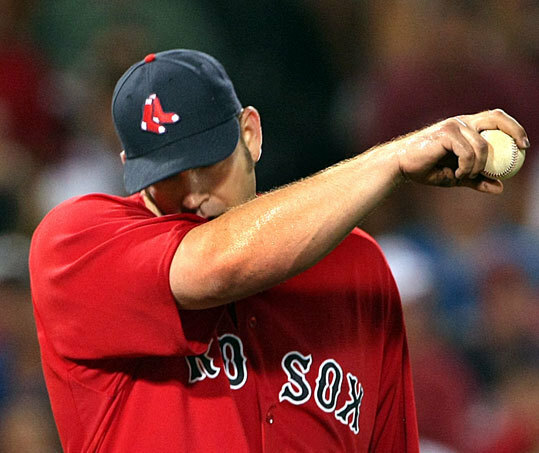 Our starter, Brad Penny, left the game after 4 innings, already having allowed 8 runs. There is an ongoing problem with Penny that was clearly shown here. I’ll let you take a guess as to what this problem is with the help of this stat- He threw 89 pitches through 4 innings last night. Yeah, Mr. Penny throws far too many pitches and therefore wears himself out ridiculously soon in the game. Sorry, but this is not the guy we want starting off a series like this. Our relievers didn’t fare much better against the torrent of hits the Yankees were bringing upon us. Michael Bowden came in and let up 7 runs in 2 innings, even worse (if you can believe it) than Penny had done. Surprisingly, Takashi Saito, one of our relievers that has really struggled this season, produced one of the few really good innings in the game, allowing no hits and no runs while striking out one. The lead just kept building, even as our offense began to FINALLY produce. We scored 10 runs in the last 5 innings of the game, but the Yankees, already leading 6-1 before this point, scored 14 runs to match that. While 14-10 might have been a decent game for us, because of those early innings, the score was actually 20-11. Yes, 20 runs. The most the Yankees have ever scored against us. As much as I hate to admit it, the Yankees have one of the best offenses I’ve ever seen live. And as much as I wish it wasn’t true, they are (right now) just about the best possible example on how to run a baseball offense. They can hit (23 hits in the game), they hustle (8 doubles and a triple), they score (20 runs), and they wear a pitcher down (see “Brad Penny”). The Red Sox offense wasn’t so bad. Against most other teams, 11 runs wins a game. Lowell went 3-5, Pedroia went 2-5, and Ortiz went 2-4. Our offense was not nonexistent. It was just dwarfed by the superior offense of the Bronx Bombers. That pretty much spells out what we need to do tonight. We have to turn up the bats, crank off some hits, and outhit, outrun, and outscore the Yankees. I’m pretty sure that’ll lead to a win. All this is not to say that the game didn’t have it’s bright points. 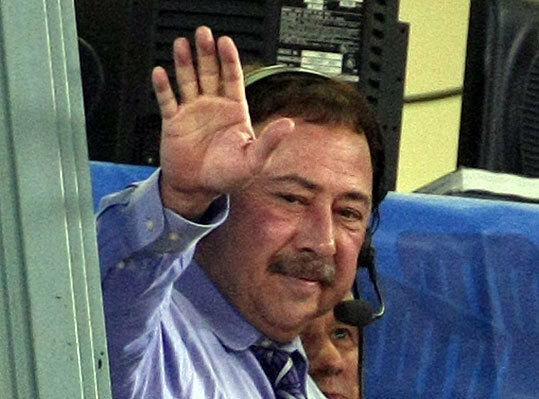 Jerry Remy was back in the booth after an ongoing struggle with depression and lung cancer. Remy is my favorite broadcaster of all time, without a doubt, and I can’t even say how happy I am to see the man doing well and back doing what he is so good at. Needless to say, I wasn’t the only one overjoyed to see the RemDawg back in business. 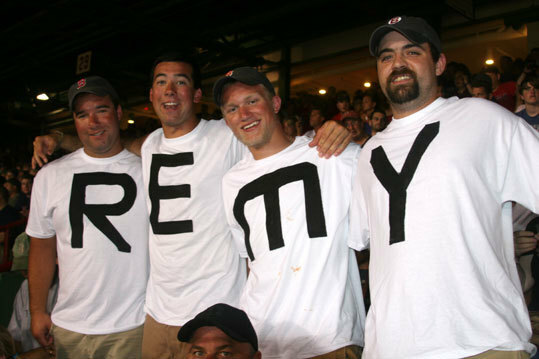 It is great to see so much love and happiness in the stands for Remy. He deserves it! Also, in the 1st inning, Jacoby Ellsbury stole 2nd base to tie Tommy Harper’s Red Sox record of stolen bases in a season, at 54. Jacoby is an ABSOLUTE speedster! We know what we have to do. We can’t let this lead keep growing bigger and bigger. Now is the time to win! I still believe that we are as good as the Yankees, let’s prove it! So tonight, let’s duplicate the Yankees’ success and lead an offensive outburst of our own! GO SOX!! …because the comeback was alive and well in Arlington, Texas last night. It is something us Red Sox fans haven’t seen for a while. The last few weeks for us have been depressing, as our guys have struggled to hit when we needed it and we just haven’t been able to come through on several wins we really needed. Heading into what everyone knew would be an exciting and decisive series with the Rangers, our hopes were high. We knew that beating Texas would be tough, but we were confident we had what it took. Jon Lester took the mound for us in the first game of the series yesterday. He was facing Kevin Millwood, who has been decent this year. Lester has been our #2 pitcher for most of the season, so we expected him to bring it to set the tone for the rest of the series. One of our problems has been good starting pitching in the last few weeks. Aside from bright points whenever Beckett pitches, we have been unable to really decide things with the quality of our starters. Texas got on the scoreboard very quickly, scoring on a 2-run homer by Michael Young as only the 2nd batter. We struggled to even it up until the 6th, making legitimate threats in the 2nd and 4th innings. Finally, Ortiz homered and drove in 2 runs, and just like that, we were back in the game. A few innings later, going into the 9th inning, the score was 4-2 Rangers, and thus the stage was set for a comeback. 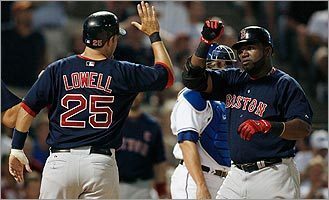 We started off by rallying for one run off of hits by Ortiz, Varitek, and Ellsbury. We were only down one run at this point. Things were starting to change course. With men on 1st and 2nd, Francona made the decision to put pitcher Clay Buchholz in as a pinch runner for V-Tek on 2nd. Pedroia then hit a long fly ball to left field. The ball bounced off the wall as left-fielder David Murphy missed his attempt to leap and catch it. This is where things got interesting. Buchholz, standing on 2nd, thought the ball had been caught. Ellsbury had seen the play and was sprinting from first, so Buchholz quickly rounded third and, sliding headfirst into home, was called out. The baserunning blunder by Buchholz had cost us an out, and things didn’t look so good. With 2 outs (the other from a Woodward strikeout), Victor Martinez came up with men on 2nd and 3rd. It was a grim situation. Martinez fought through a grueling 7 pitch at bat before he found one he liked, and doubled to deep right field, scoring both runs! The score was 5-4 Red Sox! In my opinion, this was one of those times when you really get to know your team. If the Red Sox had just figured they were going to win, and just stopped trying right there, two things may have happened. First, we may have actually won anyway. Maybe Texas wouldn’t have had enough energy left either, and we would have shut them down in the bottom of the 9th. But we also may have lost. Our defense might have come out and started playing without much enthusiasm. After maybe an error, a few missed plays, Texas may have been right back in this game. However, we didn’t settle for either of those outcomes. We stayed in the game and rallied for 3 more runs. A 6-run inning!! 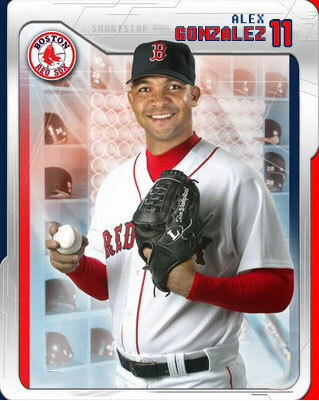 I learned something valuable about the 2009 Boston Red Sox in that inning: We have what it takes to win. All in all, it was a happy night in Red Sox Nation. 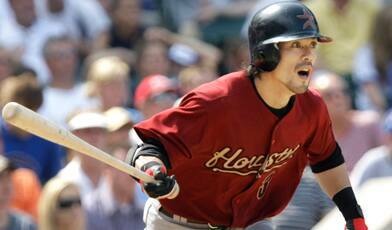 To top it all off, earlier during the day we acquired shortstop Alex Gonzalez, who played for us in 2006. As many of you probably know, we have been in dire need of a shortstop these past few weeks. Although the acquisition is meant only to be a short-term solution for our shortstop woes, let’s hope Gonzalez is the missing piece of the puzzle for this team to succeed. Welcome back, Alex! So far so good in this Rangers series. Keep up the good work, boys! p.s. Tomorrow I’m traveling up to Maine. I don’t know if I’ll be able to blog tomorrow, but I should be able to get in at least 2 or 3 entries during this next week. Sometimes when I’m walking by parking meters in the city, I like to look at the time remaining and wonder about the people parked there. What are they doing as the time ticks away, what kind of people are they? 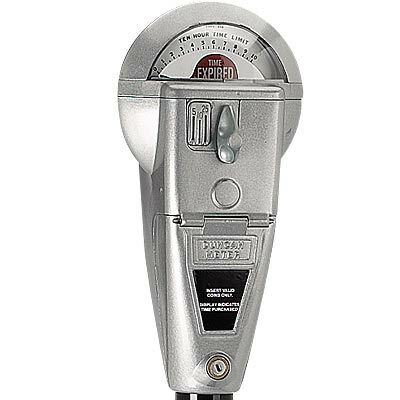 I think that a parking meter ticking away can sometimes be a good metaphor for a baseball team struggling to stay in the race in late summer. Every opportunity a team gets, they must take, whether it is the chance to to move a 1/2 game up the standings or to sign a veteran that just might have that one little skill a team needs to keep the push going. As the time ticks away on the season, fewer and fewer opportunities like these will arise, and it will become more and more important for a team to capitalize on them. Today, I believe, the Red Sox had an opportunity. We were one game from sweeping the Tigers, which would have been huge heading into a must-win series against our current wild card rivals, the Rangers. There was also, of course an opportunity involving our own division. The Yankees, with baseball’s best record and going strong, are beginning a road series against the Mariners today. The Yankees, like most teams (including the Red Sox), are stronger at home than away, probably even enforced by how hitter-friendly the new Yankee Stadium is. This is one of the only two series between our next meeting with the Yankees at Fenway, and it is important for us to gain ground on them before we face them. If the Yankees win today, we are back to where we started after their sweep of us, and we have missed out on what could prove to be an important opportunity. If they lose, we are fortunate and things remain the same as they were this morning. It is a missed opportunity because of the grim afternoon game we suffered through today. Hope was abuzz in the air before the game, the prospects of a sweep alive in many of our players’ faces. 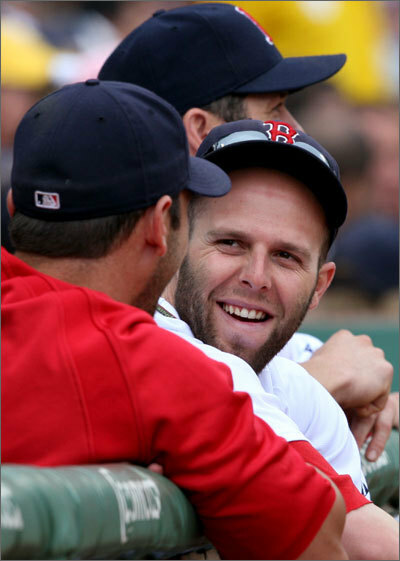 Dustin Pedroia looked happy to be enjoying a day off, and he too seemed excited for the possibilities of this game. The Tigers went up 1-0 fairly early on an infield single. They scored once more on a Ryan Raburn homer in the 7th. Clay Buchholz, our starter, pitched a decent game, going 7 innings and allowing 2 runs, only 1 earned. He has definitely showed talent this year, and has definitely been unlucky enough to be given some unfavorable matchups, as well as a fair share of close game losses. His 1-3 record doesn’t really tell the whole story, in my opinion. Tonight there is reason for excitement for Red Sox fans, as well as baseball fans. I am sure many people in Boston will be tuning in to the Yankees-Mariners game to see how it’s going for us. I am not always one to wish a loss upon another team, but tonight would be the night to do so. Sorry, Jane and others! There is also excitement in Houston tonight, as Kazuo Matsui needs just one hit to get his 2,000th pro hit. Only 566 have come in the MLB (the others in Japanese pro baseball), but it is a monumental achievement nonetheless. Good luck to him in reaching this goal! I hope that the missed opportunity for the Red Sox today will turn into a lesson for the team in the future, so that we can turn any upcoming opportunities like it into sucess! Last night the Red Sox were glad to be back in Boston as we beat the Detroit Tigers 6-5 in the comfort of Fenway. Our bats came alive, as Nick Green, Jason Bay, and Dustin Pedroia all hit homeruns. Pedroia crossed home in the first inning, putting us on the board early. It was especially nice to see Bay hit his shot, as just a few days ago he was out with an injury. Overall, it was a nice, not-too-stressful win. It feels good to be back in the swing of things, and I feel like that game was a decent first step to rebounding nicely from the Yankee series. The win over Detroit came with an added bonus: a 5-4 win for the Blue Jays over the Yankees. That means that we’re one game closer to first place in the AL East, only 5 1/2 games back right now. Things aren’t so bad in Beantown, Sox fans! Also of note in baseball last night, Troy Tulowitzki hit for the cycle and Jason Bartlett came within a single from hitting for it as well. Although several players have hit for the cycle this year, I found Tulowitzki’s especially awesome because he had accomplished 3/4 of it (all but the triple) by the end of the 4th inning. Usually players get the 4 hits more spread out in the game, because a player doesn’t always hit 3 times in 4 innings. Jason Bartlett’s effort was a little hearbreaking, because he came within a single of the cycle, which is usually the easiest part of it to accomplish. It’s always annoying to see a player come so close to something special like the cycle, even when you’re not a fan of them. All I can say is that we’ve been through the storm, and now we have to keep fighting until the end of the season.